At Salone del Mobile in April, French designers Ronan and Erwan Bouroullec demonstrated what it’s like to take a spin in a BMWi. 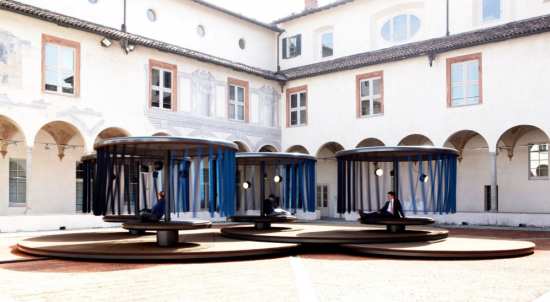 Quiet Motion, the Bouroullec brothers’ interactive interpretation of the sustainable electric car brand, was an installation open for visitors to climb onto revolving platforms to relax as the world leisurely passed around them. The designers construed the concept of sustainable mobility with materials such as fabrics made of the sustainable wool yarn used as seat upholstery in the electric car and lightweight carbon columns produced using renewable energy resources. To reference materials used in car design, blue fabric strips surrounded each of the four carousels and leather covered the platforms. Bouroullec brothers-designed Aim lamps hung from the ceilings and illuminated the area at night. Materials commonly associated with furniture and interiors such as cork and fabrics were also utilized.